12/28/2014 – Since the Chickcharney update of Ouya the RootMyOuya.1.1.apk is no longer usable. After further investigation with trying to install this program manually and checking the logcat files. It appears that due to the updates the Ouya corperation has deemed that this package is no longer signed. I shall still keep the APK up on my site for archival reasons. But when it comes to newer Ouya’s updated past 11/3/2014. If you have installed the RootMyOuya.1.1.apk prior to Chickcharney like I did you probably will not notice anything until you attempt to re-install this apk. 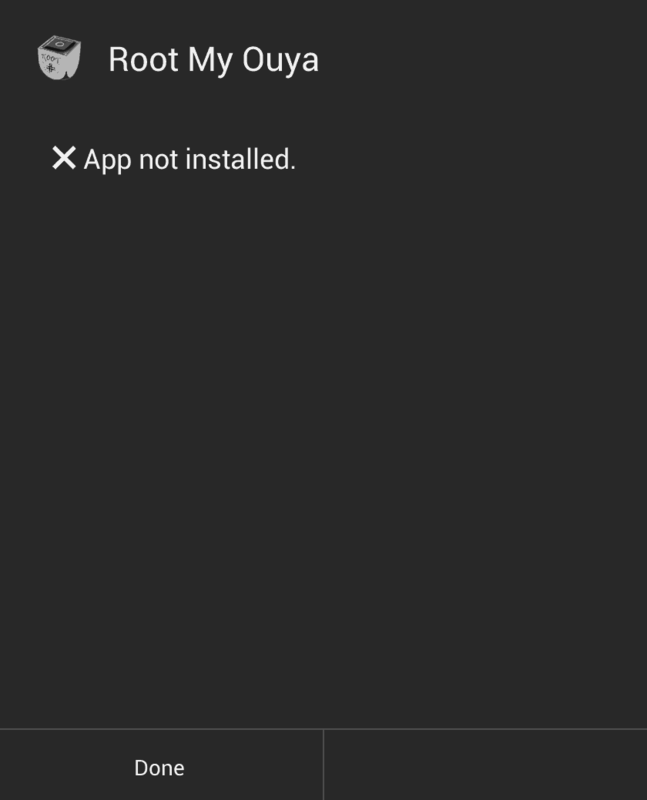 This is what you get if you try to install the old RootMyOuya.1.1.apk go back to Root My Ouya if you want the updated instructions of how to do this. 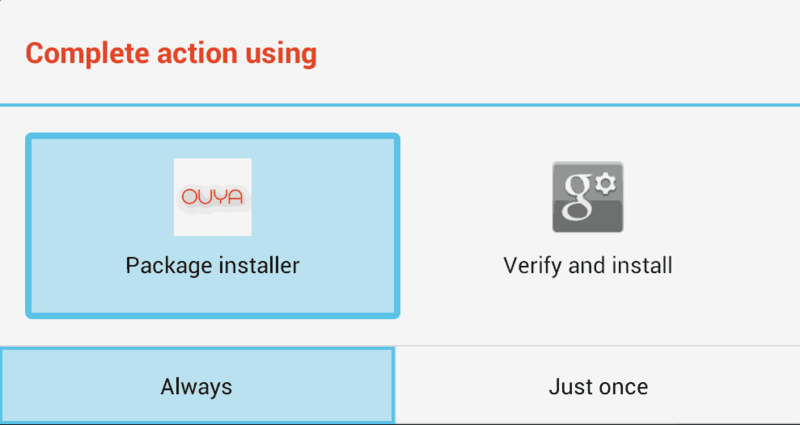 Note: Unfortunetly we cannot give you the apk RootMyOuya.1.1.apk as our web provider has detected it as a virus. We apologize for any inconvenience. Using FilePwn once again we will now install our APK. Go to the /storage/sdcard0/download or simply /sdcard/download section of your Ouya – This is where your default android browser will store downloaded files. and click the file to begin installing this APK. Note: This is just one way you can install and Side-Load APKs onto your Ouya. Another way is to install DropBox from the Ouyas browser, get an account, and load them that way. I’ve chosen this methodology of Side-Loading as it’s embedded in every Android device and it’s easy to show in blog format. In true Android fashion it may ask what program you would like to use. You will not see the “Verify and Install” yet as that is a Google Play app. However if this does come up select Package Installer and then click Always. Once installed correctly it will appear in the Make section on your Ouyas main menu underneath the Software tab. Simply click on it to launch this app. 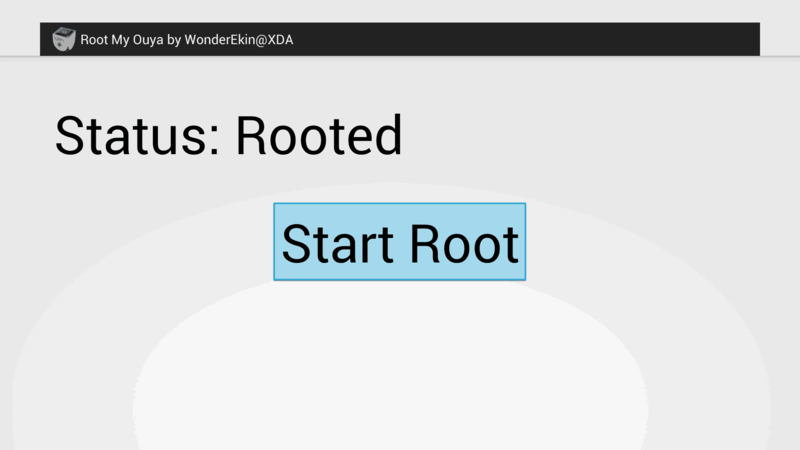 The application will come up and you simply click Start Root and the status will change to Rooted shown in the picture above. End of archived section of the tutorial. 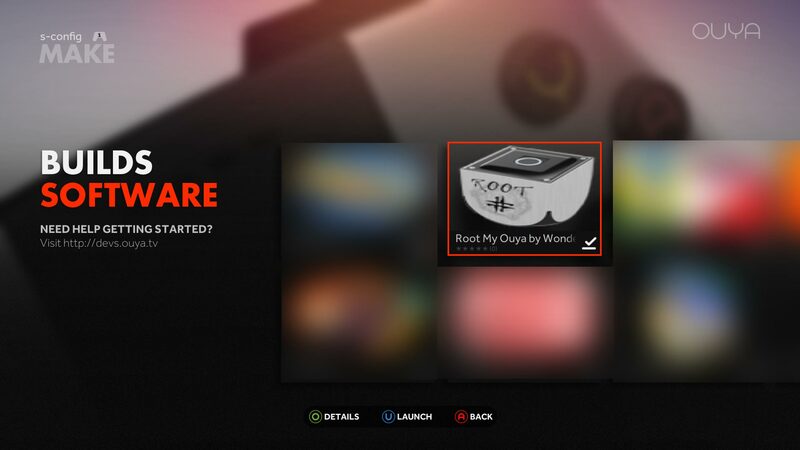 Click here to return to Root My Ouya which contains the latest updates on how to do this.